Vibrant communities depend on vibrant commerce. That’s the driving force behind Urban Juncture, a Bronzeville community developer that leverages cultural assets to create enterprises that employ residents, provide quality goods and services to locals and hosts events to attract visitors. Their goal: revitalize communities by reinvigorating local commerce. Food—in particular black cuisine—is a focus at Urban Juncture because President Bernard Loyd observed there was a shortage of quality food in the Bronzeville neighborhood and a lack of this type of cuisine in Chicago. 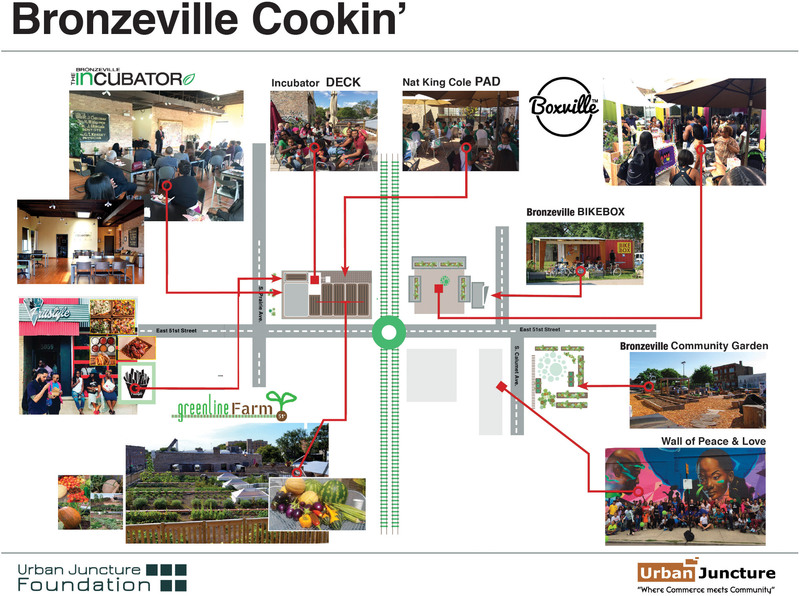 A half-dozen enterprises are housed within Urban Juncture’s Bronzeville Cookin’ Initiative, including the Bronzeville Incubator, which is an incubation, events, and co-working space; Greenline Farm, a rooftop farm; Friistyle a unique local restaurant that combines french fries with a variety of toppings; and Bronzeville Community Garden. In addition, Urban Juncture is developing Boxville, a colorful set of shipping containers that now house a bike repair shop, a mix of mini-food shops and other vendors. Eighty percent of vendors and employees live on the South Side of Chicago, and in the height of summer, up to 40 people can be found working on-site. The development is funded by private capital in Chicago and around the U.S., including a crowdfunding offering. A community development financial institution (CDFI) is also an equity partner. The organization is also certified as 501(c)(3) to accept charitable donations. While some enterprises at the site will not be profitable, Loyd feels they are important for stabilizing the area. One of the more prominent beautification efforts near the station is the Wall of Peace and Love mural, a community initiative led by Urban Juncture that has changed the tone of the area. Located on the east facing wall at the southwest corner of 51st Street and South Prairie Avenue, it covers 2000 sq. ft. and is just 150 feet away from the train station. Urban Juncture has also planted trees near the station, which has improved the look and feel of the corridor. Both the garden and Greenline Farm were created to improve the vista for people exiting the train. Train riders now see lush green landscape instead of a broken-up roof. The transit platform and Greenline farm are separated by only an 18 foot-wide alley so riders on the platform are just feet away from green. Urban Juncture facilitated placement of a Divvy bikeshare station near the Green Line stop, at 51st and Calumet, which is a last-mile resource for both patrons and staff. The Bike Box, a container-based bicycle shop adjacent to the Divvy station, repairs and refurbishes bikes and also encourages bike use among team members, vendors, and patrons. Urban Juncture is adjacent to the CTA Green Line 51st Street station and served by buses along 51st Street. A Divvy bikeshare station is located adjacent to the train station. Since 1934, the Metropolitan Planning Council (MPC) has worked to make the Chicago region a better place to live and work by partnering with businesses, communities and governments to address the area’s toughest planning and development challenges. MPC is dedicated to achieving a resilient, thriving, equitable and healthy region. Join us in implementing our 10-point action agenda to ensure our region’s drinking water systems and supplies remain sustainable. ©2018 Metropolitan Planning Council. All rights reserved.